UPDATED: Gov. Greg Abbott, delivering his first major policy address to the Texas Legislature, laid out an ambitious agenda, including an expansion of pre-kindergarten, massive tax cuts and roads as far as the traffic-glazed eye can see. Gov. Greg Abbott, delivering his first major policy address to the Texas Legislature Tuesday, laid out an ambitious agenda for the next two years, including an expansion of pre-kindergarten, massive tax cuts and roads as far as the traffic-glazed eye can see. It was a something-for-everyone speech, hitting on all the major initiatives he proposed in the 2014 governor’s race and then some. He promised gun-loving Texans that he’d push for legislation allowing them to openly carry handguns. For fiscal conservatives, he vowed to deliver a leaner government — and said he’d start by cutting his own budget by 10 percent. To middle class parents, he promised to make higher education more affordable. And to immigration hawks, he said he’d take the smugglers and drug cartels head on with 500 new state troopers on the border. There were only a few surprises in Abbott’s “State of the State,” speech, his first as governor. He finally broke his silence about whether to keep the National Guard troops on the U.S.-Mexico border. The governor said he ordered the troops Tuesday morning to stay put until his own border plan could be implemented. Abbott also unveiled the five “emergency” items he wants to put on the legislative fast track. The designation signifies what Abbott considers to be his top priorities and it also means they can be considered immediately, rather than later in the session like everything else. It was no surprise that border security and transportation would be on the list, but Abbott also included pre-K programs and higher education research funding on the list. Ethics reform was perhaps the most noteworthy emergency item on the list. Abbott had made it clear during his campaign for governor that he would push for stronger laws to eliminate conflicts of interest and restore trust in the oft-maligned Legislature. 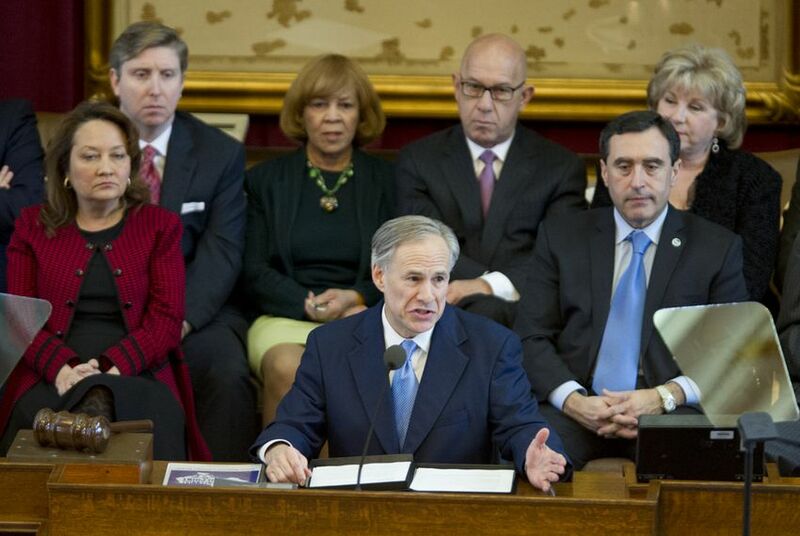 But moving it to the front and center makes Abbott the first governor since Ann Richards, in the early 1990s, to put such an intense focus on the issue. The polite but muted applause spoke volumes about the uphill climb Abbott faces in reforming the ways of the unrestrained Legislature. Among the ethics reforms Abbott specifically mentioned: Requiring elected officials to disclose contracts with public entities, “prohibiting lawmakers from voting on legislation from which they could profit” and enhanced disclosure of campaign donations and expenditures. Abbott said Sen. Van Taylor, R-Plano, and Rep. Charlie Geren, R-Fort Worth, would lead the effort to pass his reform package. The speech began with the usual pageantry reserved for the biennial event, which, like a presidential State of the Union address, purports to give citizens and their elected representatives an update on the health and well-being of their state. Abbott also noted that in January sales tax revenue surged 11 percent and hit an all-time record while marking the 58th consecutive month of sales tax growth. There was no mention of the potential economic storm clouds hanging over the state as the price of oil has plummeted. Presiding over a state with a surplus in excess of $7 billion, Abbott said he could increase funding for pre-K programs, build $4 billion worth of new roads and make higher education more affordable at the same time he cuts taxes by more than $4 billion. He also said he wants to spend $500 million to attract the best and brightest minds to the state’s higher education institutions. Abbott never mentioned his predecessor, Rick Perry, the longest-serving governor in Texas history. But Abbott referred obliquely to the criticisms of his stewardship over the state’s marquee economic development program, the Texas Enterprise Fund. Subject of a damning audit last year, the fund will not be targeted for elimination — as many expected — under Abbott. But the new governor said he would insist that its affairs be conducted in the open. And he suggested it would not used to reward friends and donors, as some claimed Perry did. The governor detoured carefully around the hot-button issue of using tax dollars for private-school vouchers. He promised to promote school “choice” and hailed the open-enrollment approach in Grand Prairie, where children who live outside the school district are allowed to attend the public schools. "When parents have more options, students win," he said. But he never use the V-word, which divides Republicans. “He did not mention vouchers, but he did talk about parents having options. If you have children trapped in failing schools in inner-cities and large districts, I too support parents having choice,” said state Rep. John Otto, R-Dayton, chairman of the powerful House Appropriations Committee. But Otto, who represents a largely rural part of Southeast Texas, said he would oppose a "one-size-fits-all" mandate because that would offer "no choice." On property tax cuts, Abbott promised to provide state money to school districts to make up for lost revenue. He specifically mentioned state Rep. Donna Howard, D-Austin, in that part of the speech, but afterward Howard said she was confused about it and didn’t exactly salute the initiative. Cutting property taxes is one area where Abbott likely will need some support from Democrats, because increasing the state homestead exemption — thereby reducing the school property tax burden — requires a constitutional amendment and therefore a supermajority of votes in both chambers. Abbott saluted the contribution of military veterans in the speech and promised to back up his praise with a commitment to reducing the unemployment rate among returning military members, in part by waiving state registration fees for those who create new businesses. The governor singled out one veteran, Richard Overton, whom he identified as the oldest living World War II veteran. He is 108. Wearing a grey suit and tennis shoes, Overton said after the event that it was “a surprise that all these people came to see me. I enjoyed it. " Eva Hershaw contributed to this story.